Back in the early twentieth century, the room above George Adams’ butcher’s shop in the market town of Spalding, Lincolnshire, was used to produce the tasty hand-made pork pies that, over time, the company name has become synonymous with. In December 2007, Tulip Ltd added George Adams and Sons Ltd to their family and consolidated their position as the UK’s market leader in food production and as a key supplier to UK supermarkets. Today, the range now includes delicious sliced cooked meats, sausages and savoury products. Adams’ knowledge and expertise ensures that every product offers great taste and flavour, with a guarantee that from farm to fork, you can always be sure of the finest quality. The UK food industry has also become highly competitive and it was this commitment to quality that led a division of George Adams & Sons, Adams Pork Products, to choose Redirack as their storage system provider. Following the extension of their chill-store, they contacted Redirack again to suggest the best solution to their needs. 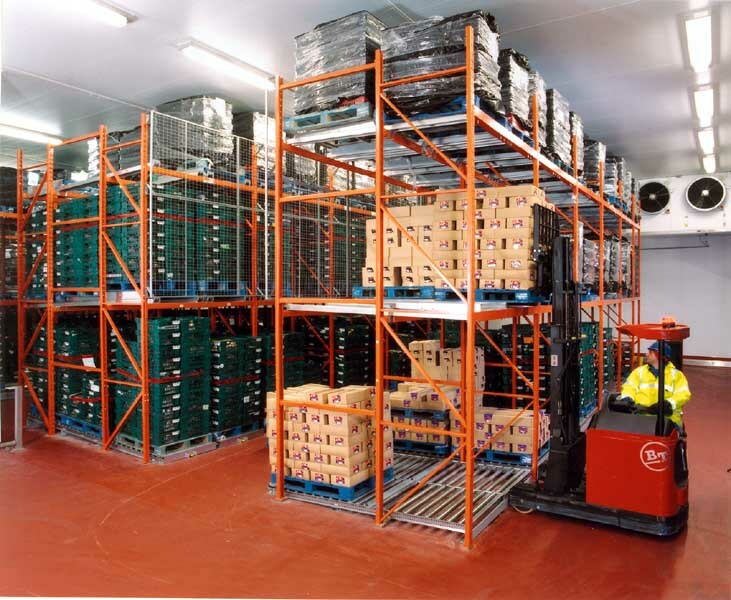 The result is an innovative storage system that utilises a pallet live storage system to obtain the best possible storage density. 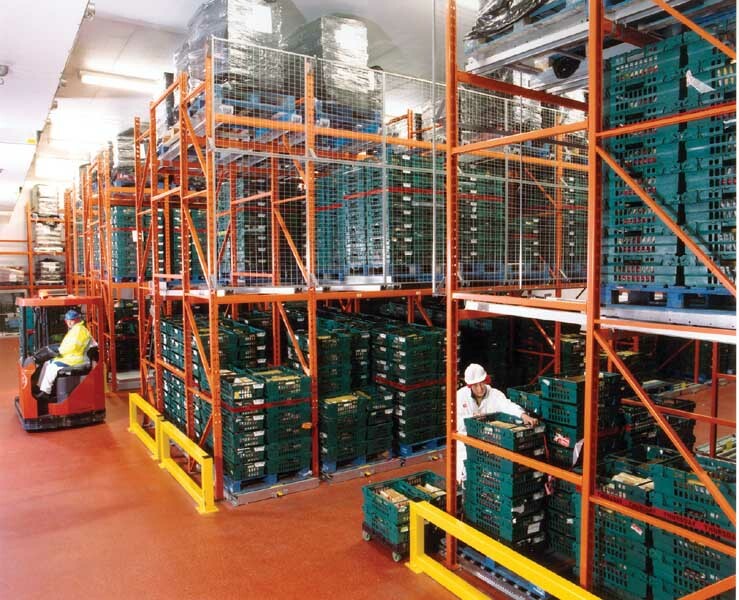 Six runs of racking, up to 22m in length and 5m high, create five working aisles. The four central runs of rack contain the live storage bays which in the case of the two central runs can be loaded from either aisle. The live storage system is loaded by reach trucks with pallets, each 1×1.2m in size and weighing 400kgs. On each pallet are trays of product which will be picked onto plastic dollies. In total the combination of dynamic and static storage within the system gives Adam’s Pork Products around four hundred and fifty additional pallet positions. 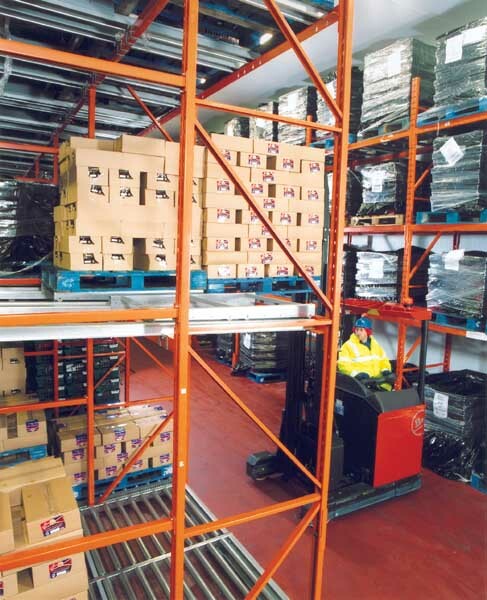 Combining forklift trucks and people within the storage system meant that particular emphasis was given to the safety of the operators. Anti-collapse mesh screens were installed at the back of each live storage lane above the first level, and running to the top of the frame. 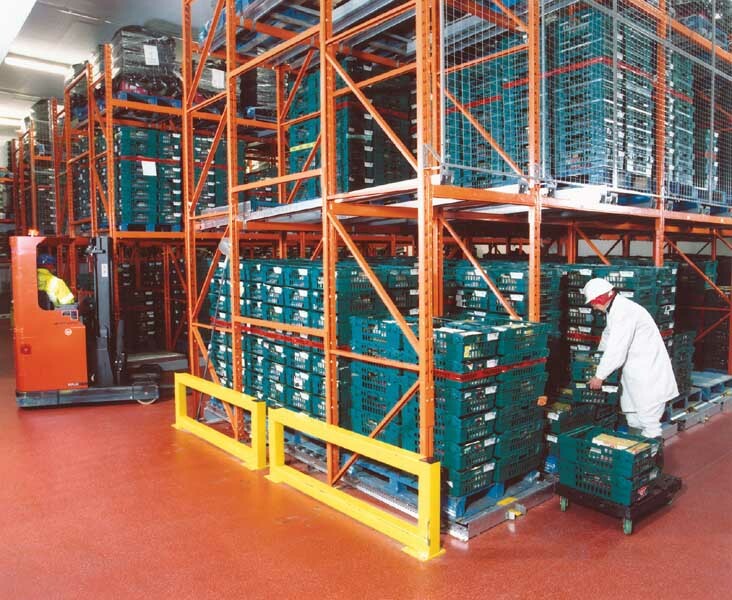 This means that pallets and trays cannot be pushed out of the system, with a potentially harmful result.